Being a freelancer is something of a foreign lifestyle choice to those that have grown accustomed to and are quite fond of typical employment. The random spots of high and low-income, no interaction with coworkers, responsibility solely resting on that one person’s shoulders, but there is one that probably baffles most of all — working from one’s own home! Of course, not ALL freelancers work from home, many have their own offices somewhere in close proximity to a coffee shop or cafe. However it is safe to say that a large number do indeed work out of their home, and that baffles those not living the freelancer lifestyle. 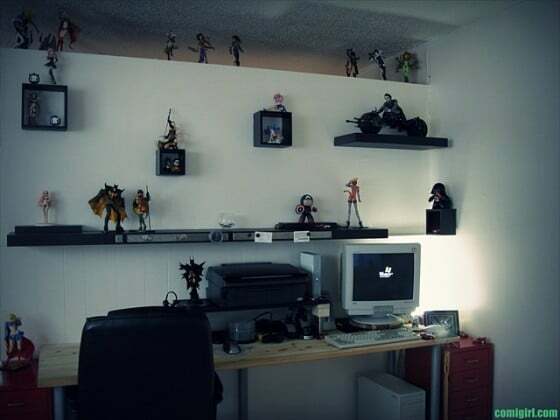 Many freelancers have some dedicated space in their home in which to do their work. And setting up a great home office is key to your productivity, sanity, and professionalism. 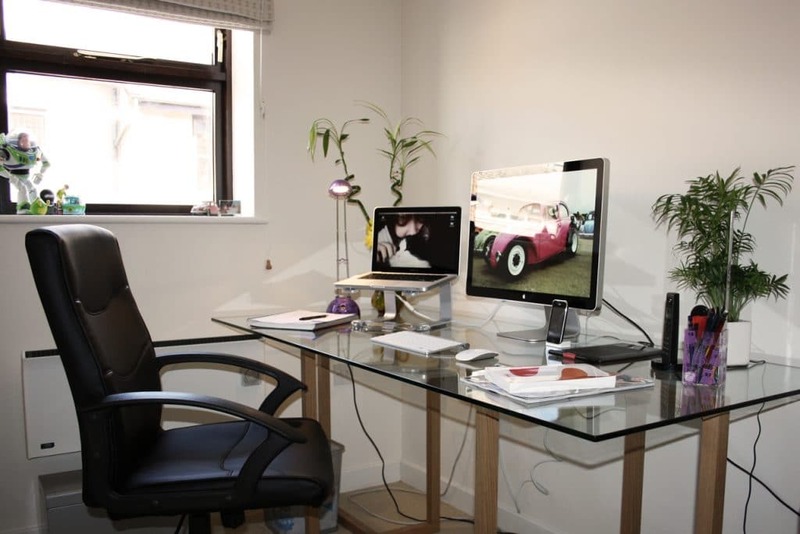 Of course, some people don’t have an entire room in their home dedicated to a home office, but if you are serious about being a full-time freelancer, having this space makes business sense. Your workstation allows you to work freely and think creatively while saying much about your personality in the process. Each setup has its own story and plays an important role in helping a freelance writer, transcriptionist, graphics or web designer finish their work successfully. Since we spend a lot of time in front of the computer, it’s important to consider your working environment and how it affects both your mood and productivity. While there are countless ways to organize your workspace and no hard and fast rules for doing so, it is still worthwhile to explore ways to construct your office setup to maximize productivity. Through this article, I will present 9 ways to do just that! The real difficulty in getting a home office just right starts with picking the right room to set up in. Choose the closest room to your front door. When considering what room to make your home office, choose the one that is closest to your door. That way, people don’t have to walk through your living room, kitchen, and down the hall to your meeting space. It keeps your private life separate from your professional one, both for your clients and for your family. There is nothing worse than a potential client, or client in general even, seeing too much of your home life. Also, it’s not nice having them walk around to the back either. Make it as sound proof as possibly needed. This depends on your living situation mostly. If by yourself, then just enough so that normal outside interferences don’t leak in. If with others, especially kids, make that baby a room of isolation. There is nothing worse than being in a meeting or on the phone and having to hear the noises of a child at play. Pick the best space match. All of the prior things mentioned are of course important, but making sure that the necessary space available to properly hold your office is just as important. The space has to be the right amount to hold everything you’ll need (desk, printer, coach/chair for visitors, etc) and a good amount of moving room. As we all know, not all rooms are created equal. Make sure you have a door that locks. This is important if you have a family who likes to interrupt you when you are in the middle of an important phone call. Being able to seal yourself off from the rest of the house (and the people or pets in it) can come in handy when you are up against a tight deadline. The less distraction you have during office hours, the better for your productivity. Where your desk is placed is very important. The wrong position can cause a lot of annoyances that could have otherwise been avoided with a different position. A good example would be placing your desk right behind a window. This placement will give your computer a glare on it at all times, and not to mention have the sun beaming right in the face of every client you meet. This is not a good way to make a good impression. Place desk perpendicular to your window, with you facing east. This allows for the sunlight to be used at its best when it is brightest, and still not affect anyone sitting in front of you. Leave your view from directly in front of your desk as bare as can be, avoiding things like bookshelves. These cause instant distractions on those less focused days, try just one calm painting instead. If at all possible not conflicting with the first tip listed, place desk directly in front of the door. It is a nice subtle touch that clients respond well too without knowing. Make sure your desk will actually fit comfortably in this room. If it’s too big, you will feel cramped and claustrophobic! Be honest about how much desk space you need. You might love the huge mahogany wrap-around desk that was passed down from your father, but it might not be a good fit for your space. The only thing on my Christmas list this year was a good office chair! Find something that is comfortable, with adequate lumbar support. You’re going to be sitting in this chair all day, so make sure you choose quality over a cheap price tag. Your body will thank you for it, trust me! The most ergonomically correct chair might not be the most stylish or best looking. In all honesty, looks don’t matter when it comes to comfort. You want to find something sturdy that will last longer than any passing furniture trend or fad. Honestly, a chair is just a chair here. All the extra thoughts and feelings that first pop in anyone’s head should be thrown out the window because they do nothing more than creating a distraction. Think about it, if your office chair is really comfortable, what is going to put a halt at taking a snooze break in the middle of working on something? How about if it is so unique that you have to spend more than half a second figuring out how to sit down in it? Seconds add up over time! The only qualities that matter most are reliability and durability. Here are a few tips on finding that office chair you NEED. Avoid the good looks. There are many chairs available that look good and are well put together, but after a little time of use, begin to crumble. Having your own office will hopefully mean you’ll be calling your own shots for a long time. So make sure that you’re looking for a chair that matches that ideal time frame. Find suitable material. The material used to make your chair must match the conditions that you like to work in. Say you’re the type that likes it to be hot, would a leather chair really be your best bet? Or how about someone who likes it cold, would a material that tends to harden in cold weather be your best bet? A clean, organized office is a much better place to work (and see clients in) than a cluttered, messy office. Unfortunately, mine is usually on the cluttered and messy side. I’m working on that! I have installed some great bookshelves above my desk and gotten some colorful boxes in which to hide all sorts of office supplies so the space looks more organized. I also have a great filing cabinet that fits right under my desk and out of the way. One less surface for me to throw stuff on! I am meticulous about filing, so if I ever need to find a document quickly, I always can. Having an organized office is a great way to impress visiting clients. It shows them that you take running a freelance business at home seriously! If you find your workspace getting cluttered and crowded, take a step back to see if there is anything you can get rid of—things you haven’t used in a while. Keep older files that you don’t use on a regular basis stored elsewhere. And if you tend to buy in bulk, keep only what you currently need or use in your office. Twenty-four tape dispensers can take up valuable space when stored in a small office. Being in a home office, working for yourself, makes every document that you receive via paper or email three times as important. So while those who work in a corporate office have multiple people with the same documents, and being on file somewhere, the self-employed only have themselves to turn to when something goes missing. This is why being properly organized is a critical necessity for anyone looking to be successful at being their own boss. Properly arranging documents with the three A’s. All documents, whether physical or digital, should be arranged into the three main A categories and subcategories by year and month. These being archiving, active, and anticipating. Each A represents a stage in the typical life cycle of a project, or anything else really. Using this system will help easily identify documents when the need comes for them to be found. Never leave your desk cluttered for more than two days! It is quite easy to be so busy with work that needs to be done to forget about the environment you’re working in. One day of not noticing and coming back the next morning to see all the papers and items relating to what was being worked on yesterday all over the place is acceptable now because of the vague memory from yesterday about what everything is, but the next day is another story. Things will be looking quite unfamiliar. That is why two days is the max! Unpack briefcases/travel bags regularly. If your schedule requires to leave the office on the regular, its understandable why it would make sense to keep things put in your bag of choice. However, this will become a problem when you become so accustomed to those items being there so much that they are forgotten of. So, it is always good to regularly take things out and get them back into the organization structure of your office. Spending enough time in the corporate world will make it easy for anyone to become accustomed to walking at least a few yards to reach the printer, get new paper for the said printer, grabbing something out the refrigerator, or other walking tasks office life entails. Like it or not, it gets into your head and becomes what you are used to. Considering that, how would things be for someone finally being able to set things up the way they need? Let’s just say, the best ideas might not be implemented. Freedom is a wonderful thing, which is why you’re freelancing in the first place, but it can’t be abused. Always have a clear walkway to and from the desk to the door. The experience from having to maneuver around your desk, and other objects, just to reach the door and vice versa is not a good experience. Especially when it’s done multiple times during your workday. Add in the times when you are just so frustrated and everything can irk you even more, it can easily take your mood further in the wrong direction. Always aim for slightly undersized furniture. It is hard to resist that nice big oak desk, but having it take up the majority of your space is a huge negative. It throws off the entire flow, makes it harder to accurately place other items, and everything extra that you’d need to put in a bigger piece of furniture could be in something smaller and separate with better placing. Keep in mind how you do things. The way anything personal is laid out should match a personal approach in how one likes things done. An example would be someone who likes to do a few light stationary exercises at the beginning of the workday, it would be ideal to have an open space right by the entrance to do that. How about if you like being able to choose from an assortment of food items throughout the day to enjoy? Something like a mini-fridge would be convenient. It’s all about the little things here. Use decorations to express your personality and motivate yourself through visual encouragement. 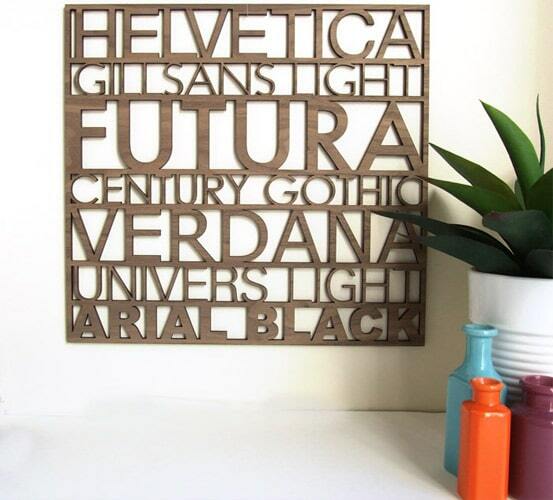 Put some of your favorite prints, artwork, or photos up on your walls. I have my college diplomas displayed in my home office—they remind me of all of the hard work I did to get me to where I am today. Plus, they look a little funny hanging in my kitchen and a little pretentious hanging in my bathroom 😉 . Paint the walls a color you really love. Get an accent rug if you have the space and make sure you dress the windows accordingly. It’s amazing what some great blinds and curtains will do to a room. 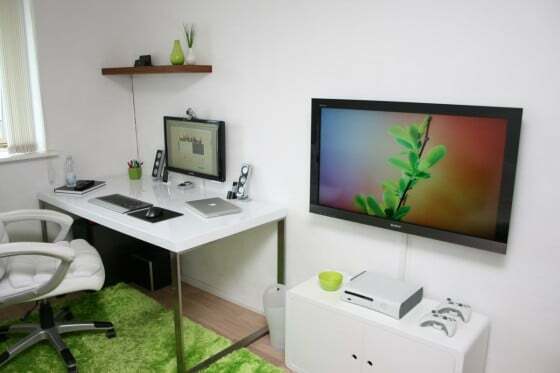 Make your home office space where you like to go and work, and you’ll be more productive. One of the elements that have a large impact on the overall appearance of your home office space, but is often overlooked it lighting. You should try to incorporate two sources of light into your room – an overhead light as well as a task light. If you prefer a natural feel and you have access to it, natural lighting can do wonders to improve your mood in addition to providing the light you need to get the task done. Extra seating can also be highlighted by a floor lamp. It’s easy to express your personality through lighting with a large variety of modern styles available today. It’s also important to set up the lighting to reduce glare. Your desk lamp can use LED technology to consume less energy and be more efficient overall. Use curtains or a lampshade to reduce glare. Having a focal point that directs your attention can keep you focused on the task. Many home offices don’t have one but it’s to your benefit to establish one. For designers, this can simply be your MAC or PC at your desk. To enhance the visual impact, offset your computer with some hanged grouped artwork in the background or installing a specialized wall treatment such as wallpaper or a mural. Adding an area rug also grounds the space and adds a little something extra in the process. A focal point is a necessary design element that grounds space so take careful considerations in how you wish to organize it. It may be beneficial to set up your home office and the materials you wish to include in it, then chose a wall color that compliments them as opposed to the other way around. Remember a room can be interesting without the walls screaming of color, so choosing a neutral shade with a touch of color may be to your benefit. It’s also hard to grow tired of a neutral color, which means less painting over the long haul. And remember that colors are often more intense than they are on a paint chip so you’re the best bet is to move down a shade or two on the color card before finalizing. Yellow is known to stimulate creativity, clarity of thought, and mental activity – making it an excellent choice for a home office color. Red is an aggressive color, so it’s good for those selling or making deals. Blue-Green can be a soothing color – a great choice for writers. Oranges encourage socialization – great for a small office using a team approach to management. Here’s a guide on Color Psychology that can help in your decision. Your office design can match your brand, have fun with it! Your home office has a big impact on your productivity, creativity, and energy levels. Clutter as well as an uninspired space can deter your business goals, so taking these steps to enhance your home office setup can help your feeling of personal success.